Darren and Caroline’s kitchen was last on the to-do list in their beautiful home. The kitchen was small, dark and needed functional improvements. 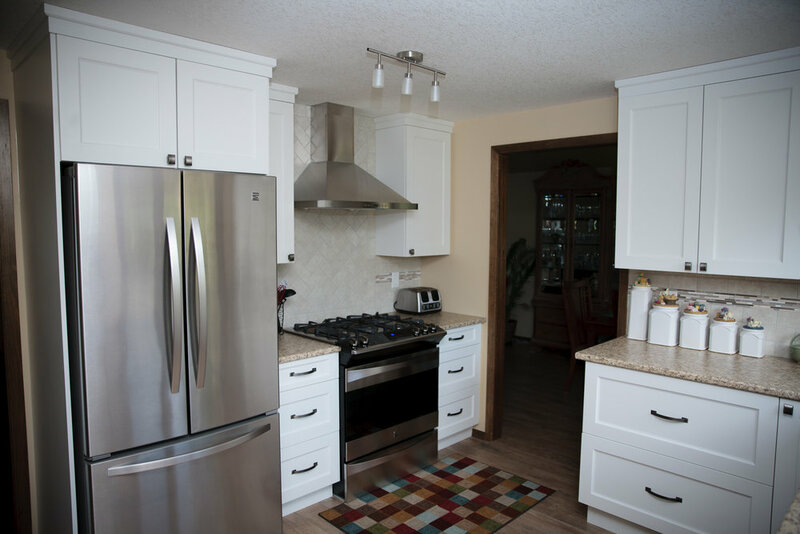 When the Beard’s contacted us about their kitchen renovation the intention was to update with new doors and countertops but we quickly decided that in order to make the kitchen meet the needs of their family they needed more than an update, starting with the appliances. 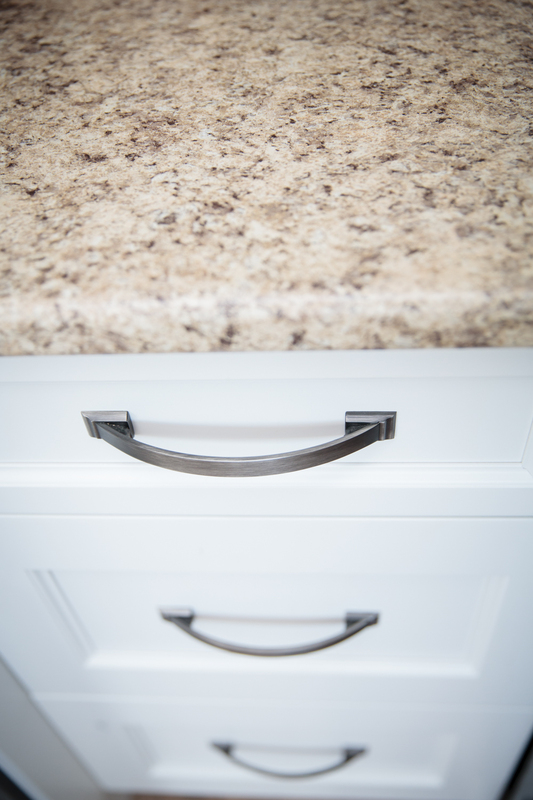 Their wish list included: a gas range; make it feel more open and add more counter space. Before the renovation there was a small cooktop in the peninsula, a tiny 24” wide built-in oven, and the fridge crowded the entry to the formal dining room. We moved the fridge closer to the main dining area which opened up an area for their coveted gas range. This also opened up the area around the sink which is now a great workspace. Darren and Caroline used Lectus Cabinets for the cabinetry and selected a painted maple doorstyle with laminate countertops. We decided to use a classic colour palette that they will enjoy for many years. They also opted for the Project Management service as they are both very busy and unfamiliar with trades they could trust. My favourite feature in Darren and Caroline’s kitchen is the backsplash pattern behind the range. The tile is classic and simple but the pattern sets it apart and catches your eye. We had Tegan design and implement a kitchen in our almost 40 year old home. Tegan came to us with a design that completely met our needs as a family, as well as our budget. After going over the proposed timeline and the design itself, Tegan and her crew got to work. Tegan, as well as her crew, including her husband, Nik, were courteous and understanding of our needs during the renovation. Her team was always polite and professional and exceeded our expectations. Tegan's design met all of our needs and wants, she designed an exceptional product in a limited space. Thank you to Tegan, Nik and her team of professionals. We would highly recommend Tegan at Locale Designs.